nually to the Board of Trustees until 1916, with the exception of the years of the Civil War. 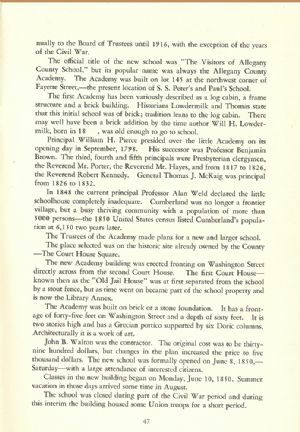 The official title of the new school was "The Visitors of Allegany County School," but its popular name was always the Allegany County Academy. The Academy was built on lot 145 at the northwest corner of Fayette Street,—the present location of S. S. Peter's and Paul's School. The first Academy has been variously described as a log cabin, a frame structure and a brick building. Historians Lowdermilk and Thomas state that this initial school was of brick; tradition leans to the log cabin. There may well have been a brick addition by the time author Will H. Lowdermilk, born in 18 , was old enough to go to school. Principal William H. Pierce presided over the little Academy on its opening day in September, 1798. His successor was Professor Benjamin Brown. The third, fourth and fifth principals were Presbyterian clergymen, the Reverend Mr. Porter, the Reverend Mr. Hayes, and from 1817 to 1826, the Reverend Robert Kennedy. General Thomas J. McKaig was principal from 1826 to 1832. In 1848 the current principal Professor Alan Weld declared the little schoolhouse completely inadequate. Cumberland was no longer a frontier village, but a busy thriving community with a population of more than 5000 persons—the 18 50 United States census listed Cumberland's population at 6,150 two years later. The Trustees of the Academy made plans for a new and larger school. The place selected was on the historic site already owned by the County —The Court House Square. The new Academy building was erected fronting on Washington Street directly across from the second Court House. The first Court House— known then as the "Old Jail House" was at first separated from the school by a stout fence, but as time went on became part of the school property and is now the Library Annex. The Academy was built on brick or a stone foundation. It has a frontage of forty-five feet on Washington Street and a depth of sixty feet. It is two stories high and has a Grecian portico supported by six Doric columns. Architecturally it is a work of art. John B. Walton was the contractor. The original cost was to be thirtynine hundred dollars, but changes in the plan increased the price to five thousand dollars. The new school was formally opened on June 8, 18 50,— Saturday—with a large attendance of interested citizens. Classes in the new building began on Monday, June 10, 18 50. Summer vacation in those days arrived some time in August. The school was closed during part of the Civil War period and during this interim the building housed some Union troops for a short period.